Prior to unleashing the front-kick heard ’round the world at UFC 126, Anderson Silva appeared on stage with the hottest b-boy dance crew in the world. While last February’s performance with the Jabbawockeez was something to behold, it doesn’t compare to what “The Spider” did with Justin Bieber last night in Brazil. “Ok its on!! the fight has been announced…me vs @spideranderson – I am NOT the heavy favorite. haha,” Biebs posted on his Twitter with the picture above. While the planet’s biggest pop star was joking about a potential tango with the UFC middleweight champion, the two did dust off their dance shoes and cut up the stage together to the delight of everyone inside the arena – as well as those who caught the YouTube clip at home. 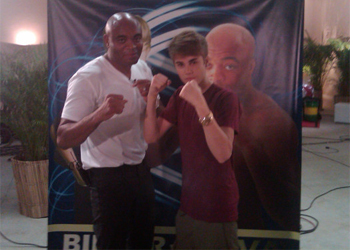 For those that want to believe Bieber is just now hopping on MMA’s bandwagon, think again. He was sitting front row with UFC president Dana White this past July for UFC 132. He even gave his take on the controversial decision rendered between Matt Wiman and Dennis Siver. Who woulda thought, baddest 185-pounder in bare feet is a BELIEBER!